The Dariba hydrometallurgical zinc smelter is located in the Rajsamand district of Rajasthan in Northwest India. The smelter has a capacity of 220,000 MT of zinc and 116,000 MT of lead. In the year ended March 2018, it produced 217,433 MT of zinc and 95,797 MT of lead. 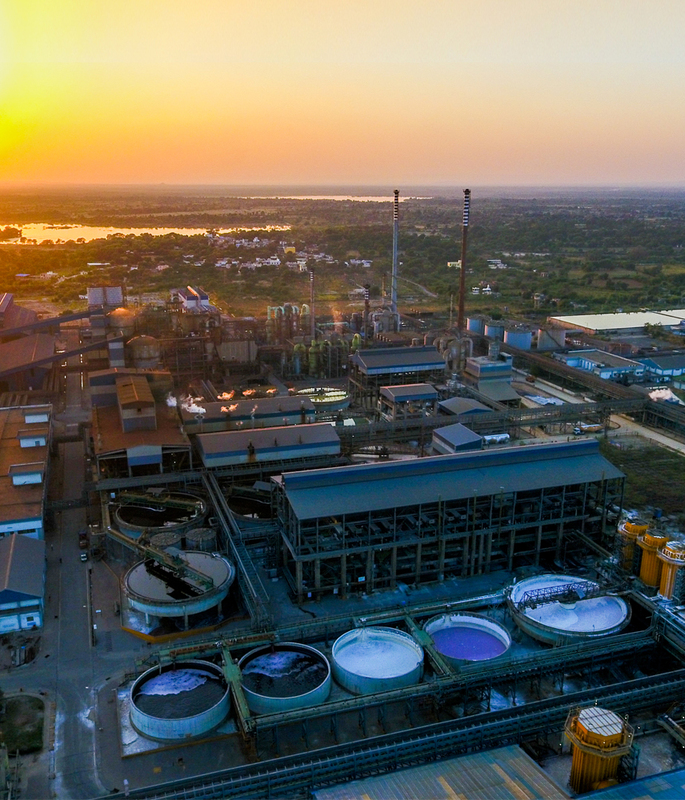 The complex is uniquely self-sufficient – there are lead-zinc mines in the vicinity at Sindesar Khurd and Rajpura Dariba. The zinc smelter at Dariba was commissioned in March 2010 and has a capacity of 220,000 MT per annum. In July 2011, a 100,000 MT per annum lead smelter was commissioned. A majority of the power requirements of the facility is sourced from the coal-based captive power plant at Dariba. Dariba Smelting Complex employs Roast Leach Electro-winning technology at its hydrometallurgical zinc smelter. The plant has two roasting facilities, a leaching and purification section and a cell house. The lead smelter employs SKS bottom blowing technology. The plant consists of SKS Furnace – bottom blowing, blast furnace, electric arc furnace & fuming furnace, and electro – refining. Fuming furnace is also installed to produce zinc Oxide from blast furnace slag. The hydrometallurgical smelting process is a roast, leach and electro-winning (RLE) process. In this process zinc concentrate is first oxidized in the roaster and the gases generated are cleaned and sent to the sulphuric acid plant. The primary output from the roaster, called calcine, is sent to the leaching plant to produce a zinc sulphate solution that is then passed through a cold/hot purification process to produce purified zinc sulphate solution. The purified zinc solution then goes through an electrolysis process to produce zinc cathodes. Finally, the zinc cathodes are melted and cast into zinc ingots. The waste called Jarofix is dumped in secured land fill. The SKS furnace smelts the lead concentrate using oxygen by bottom blowing process to produce bullion. The gases generated from smelting are cleaned and sent to sulphuric acid plant. SKS furnace slag is than reduced in blast furnace to produce bullion. Bullion from both SKS furnace and blast furnace are melted and cast as anodes for electro-refining and producing lead cathodes. Finally, the lead cathodes are melted and cast into lead ingots. Blast furnace slag is further fumed to produce zinc oxide and the final discarded slag is sold to cement plants.